Exactly a week ago, to the hour, I was nursing a pair of VERY aching ankles. For a health professional used to being confined to a chair all day the experience was physically draining but mentally rejuvenating. I must confess, I wasn't sure if my ankles would last the drive to Palakkad but Satish's company till Gudalur kept my mind off it at least part of the way. 21st February 2009. A day that will be marked in my life. Literally, because I have developed a nice tan standing in the sun all day. I had only been accepted as a member of KANS and I had an opportunity to do something I always wanted to do. Conservation activity at ground level. 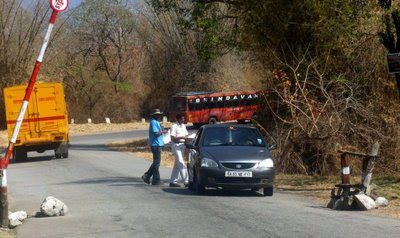 I was part of a small team of volunteers from KANS conducting an awareness in Bandipur. The teams agenda was to educate drivers on safe driving in National Parks. Along with distributing leaflets on the primary objective the volunteers also emphasized the need to avoid smoking, honking, picnicking, drinking, feeding wildlife and playing loud music. The team was lead by a firebrand Soumyajit & a sober Rakesh. As we left after breakfast, a kilometer in the park we encountered our first set of 'students', three carloads of 40 to 50 year olds. Some were answering nature's call while others were competeing to see who would make more smoke rings. Vasanth, Hari and me got off and requested them to stop smoking and move move on. Most were polite, some gave us queer looks and other told us we were doing a good job but then, they had to stop because someone wanted to pee. I wanted to tell that if a wild dog or an elephant took a fancy they would be peeing into a bed pan the next day. I restrained myself and we repeated our request and moved off as they piled into the cars and started on their journey to Ooty. A little down the roadway, we met these two gentlemen from Kolakta, looking absolutely lost. They worked in Bangalore and thought a holiday in the wild would do their systems good. They got onto a car and drove off. 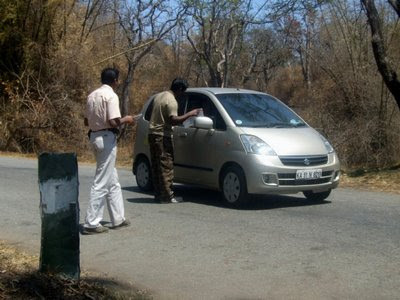 The car reached Bandipur and when they stopped, NO ROOMS AVAILABLE!! So what does Babu Moshai do? Grab a stick and take a walk in the National Park. It was a good thing we found them before some carnivore decided to try HILSA! At the check post we were hopping like rabbits. It was hot and dry. Water supply was disappearing fast but old men felt younger in the company of enthusiastic brothers. We stopped more than 800 vehicles at the Kekkenhalla check post. Most were very receptive. Some were downright rude and a one even stopped his car to enquire more about this programme. I felt sad for Soumya, some 30 minutes in the baking sun with two very enthusiastic guys left his nose looking a bit like Ruldoph the reindeer!! 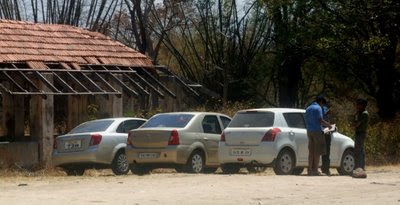 Of course, 800 odd vehicles, you surely will have a chance encounter with "wildlife" of the two legged kind. We spied a car drive past the border and got ready to stop it. Imagine to our amazement when a plastic soft drink bottle flies out of the window barely 50 meters from us. As it is we were hot under the collar, now this got us all steaming, including the sober Rakesh. We stopped the car only to find a sour faced driver with the co-passenger reclining next to him. When we politely requested him to pick up his garbage the co-passenger, who till then was sleeping jumps up, brandishing a bottle of Chivas Regal in our faces and in a slurred voice says, "We have no plastic bottle. Only this". We tried reasoning politely, telling him about a fine stiffer than his drink. Somehow the word got to him, "I've already been fined on the other side" he said and for good measure added "B*****d". Then things progressed fast, unfortunately for the driver. Mr. M, forest official manning the check post pulled out the ignition key and ordered the driver to pick up his garbage. After some initial reluctance he complied. By then then inebriated guy too was out of the car shouting more fiercely, but Mr.M was made of sterner stuff. He confiscated the remains of the premium scotch, got them to write an apology letter and also pay a fine, I think of Rs.500/-. Of course the drunk was past the stage of reasoning so he had the last laugh. He threw out the bottle again, not 50 meters after crossing the check post!! We wound up well past 7 PM, mainly because there was no electricity at the checkpost. The only solar lantern had a panel but no lamp or working battery. We thought we need to do something about it. We left Mr.M and his companiion swatting mosquitos in the dark for a well desreved dinner. Nice report. Rajesh, though I may be looking calm and sober but I believe in discipline and if I see someone breaking rules,then my soberness turns the otherway. Hey Rajesh, a brilliant report, could actually visualize again the incidents especially the encounter with the Chivas Regal Man..........and Thanks a lot for joining the team and making it a successful event. Good report. Haven't been on this campaign since the inaugral one in October 2008, but reading these reports makes me pine to come back...hopefully in March! Loved this informal report. Guess you had a great time at the campaign. Hope to see you in March. Thanks guys. Always a pleasure doing my bit for conservation. I need to thank you all for helping me find that direction to channelize my efforts. Nice report Doc. Had a nice time early in the morning reading your blog. Will meet soon. Great report, doc. Enjoyed reading it. Rajesh very nice trip report. Brings back the memories from the last campaign and waiting for the next campaign! good report doc. must have been thirsty work. for the sake of greater detailing: what happened to the remaining chivas regal finally?